Scope and Content Irvine Iron Works, Gottries Road, Irvine, North Ayrshire This shows the Harbour Street frontage of the foundry from the north-east, with the top of the cupola above what was probably the light moulding shop. The building on the right, with its exposed steel frame, was presumably the heavy moulding shop. This foundry closed later in the 1970s, and was acquired by Irvine Development Corporation who demolished it and built new housing on the site, in a traditional style. 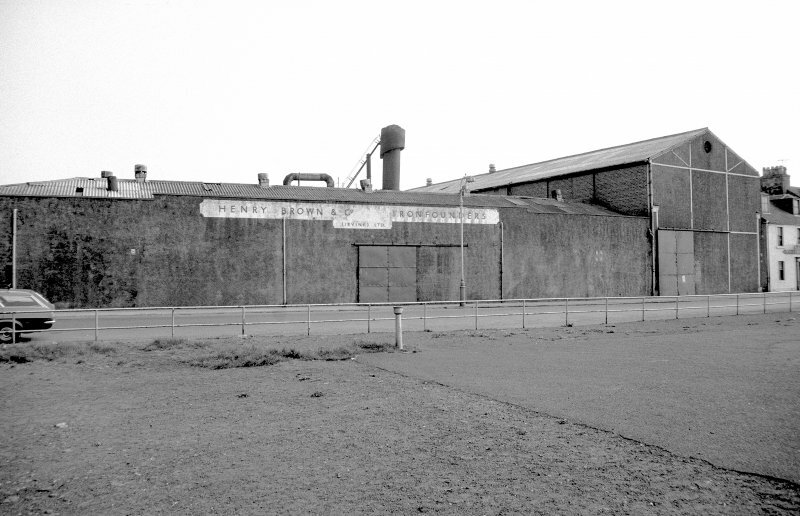 This foundry was established in 1909 by Henry Brown, and in 1971 belonged to Henry Brown & Co (Irvine) Ltd. It occupied a large area of ground between Harbour Street and Gottries Road. It appears to have been a jobbing foundry, but as no access was allowed into the works, this is not certain. Source: RCAHMS contribution to SCRAN.